HUNTINGTON-WV (HNN) - The 2011 Saint Joseph Invitational Spirit Awards and 2011 SJI All-Tournament Cheerleaders were presented to the participating schools at Veteran's Memorial Field House on Saturday night, Jan. 22. In addition to recognizing basketball teams the SJI recognizes student bodies for cheering, theme presentations, spirit and good sportsmanship. The 2011 Outstanding Theme Presentation was awarded to St. Joe with Cabell Midland receiving the runner-up award. The 2011 Best Cheering Section was awarded to St. Joe with Fairland receiving the runner-up award. 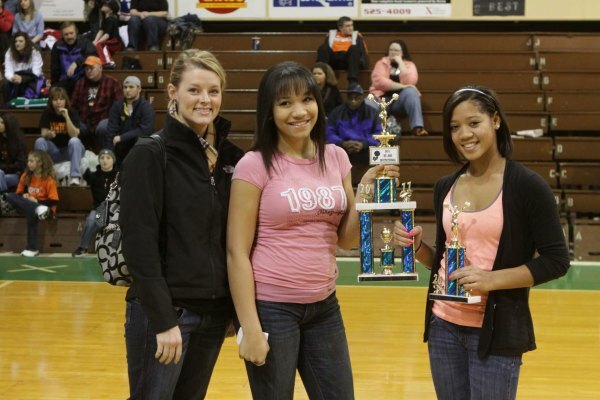 Wayne High School won the 2011 SJI Best Cheerleading Squad and St. Joe cheerleaders won the runner-up award. Cabell Midland High School won the 2011 SJI Team Sportsmanship Award.